You are here: Home > New Lumia 530 (Rise) on its way to T-Mo? New Lumia 530 (Rise) on its way to T-Mo? If the “Rise” does arrive, it’ll help bolster Magenta’s Windows Phone offerings, which some might say is a necessity. Currently, WP options on T-Mo are limited and we still haven’t heard of T-Mobile plans on releasing the upcoming flagship Lumia 930. The brightly colored phone is essentially the GSM equivalent of Verizon’s exclusive Lumia Icon. As for branding, now that Nokia is no longer its own company, and even the company’s HQ in Finland has had all “Nokia” verbiage removed, it’s likely that all future Lumia devices will launch minus the old brand name. We don’t have a release date for the Lumia 530, but once it’s official, or we hear more from our usual insider elves, we’ll be sure to let you know. The 635 is single SIM variant only and coming to T-Mobile. It’s the 630 that’s got the choice of single or dual SIM variants. As mentioned, the 635 is single SIM LTE and the 630 is HSPA single and dual. Hopefully, it will work for the 700 band. for God’s sake 1gb Ram pleeeeeeaaaaaaaaasssssssssse! *This is a joke. I have nothing against WP. I understand it’s a joke, but you should know that it’s a very old joke now. With the global market share of Windows Phone currently at 4%, it’s pretty recent actually. No, the market share has been low for a long time now. So, yeah, it’s an old joke. Chickens crossing the road today does not mean it’s not an old joke. My guess here is the 530 will be the true successor to the 521. The 635 will replace the higher-end 925 just like how the 521 replaced the higher-end 810. 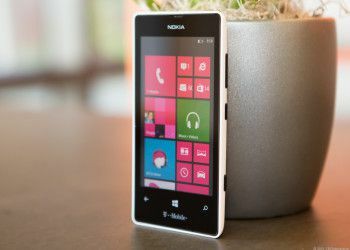 T-Mobile has a history of replacing more expensive Windows Phones with budget models as their successor and this just appears to be more of the same. It’s primarily because those budget models are perfect for new smartphone users and they sell – and sell really well. That phone looks hot. I want one. T-Mobile hurry take my money!!!! Which phone? The one in the story? That’s the 521. TMO is just not paying attention on WPs. They all misa one thing or the other. 521 dont have flash and front camera but has SD card. Others dont have SD card at all. No perfect WP on Tmobile. Oh please. There’s no perfect Android on T-Mobile, either. Just buy unlocked and bring it to T-Mobile. yeah,,,, but then LTE is the issue… Tell me any unlocked WP phone that will work on LTE, HSPA, 3G on TMobile and not missing either one. Erm… Nokia Lumia 1520.3. I know next to nothing about Windows Phones, have never researched any Windows Phone with the intent of buying it other than the 1020, and I found that within 30 seconds. The only 1520 model that will work perfectly with TMobile on LTE, HSPA, 3G is RM-938. This model WAS available with only 2 sellers so far online. This model is not even available anywhere. It’s 6 inches screen. A little big. An ideal phone screen is 5″ or 5.5″ (according to me). Second that. I sold my unlocked 1520 for a 1020. Luckily I live in a refarmed city. I live in NYC and its refarmed also but still I am picky about the perfect bands for the speed. TMo is coming with another one and it looks good BUT it dont have a flash. Those are really hard to come by at this point. Negri has them backordered or discontinued. Not sure Newegg has them anymore either. People into Windows Phone KNOW about these devices, but at the end of the day, nothing’s better than having a phone from YOUR carrier, especially when you can get it unlocked after awhile. of course they aren’t parying attention. they are too busy selling golden band-aids…. I haven’t read anything about a Lumia 530 on WPCentral… Seriously, though, T-Mo needs to get another high end or at least midrange Windows Phone. I don’t see the point of getting a 530 AND 635. That is odd. I sent them a tip after seeing this on twitter. But it seems that something is not adding up on their end. Thing is, no one has even heard of a 530. I would be completely shocked if it broke cover as a T-Mobile device. Doesn’t seem quite right in many ways. We’ll see. The 635 is the successor to the 6xx series. Nokia sells a 5xx, 6xx, 7xx, 8xx, and 9xx (and last year added a 10xx). The 6xx series typically comes with some bells and whistles not found on the 5xx series (like rear camera flash and front facing camera). It doesn’t matter as all Windows Phones in T-Mo stores in my area have no power to them and are never powered on. T-Mo should admit they don’t like WP. You might want to take that up with the stores. My store has both of ours powered on and live, but sometimes the display models go bad and we have to wait on certain parts to get them running properly. That might be what’s going on, but saying something goes a long way. I know it’s not all stores but the three in my area all (ironically) stated “The power at the wall is bad.” One store associate finally admitted the cable was bad and the store didn’t want to spend the money to replace them because “Windows Phones don’t sell.” I told him if I’m buying a phone, I want to try it out first. Then asked how can you sell phones that aren’t powered on? His answer was shrugged shoulders. I know it’s easier to sell Android, especially Samsungs, and iPhones but to say a it’s not worth fixing the power cord because the phone doesn’t sell seems very fishy to say the least. And this was three stores all with the same exact story. It’s probably called the 530 and not the 525 so T-Mobile can make it a millimeter or two longer so that none of the shells for the 525 will work. They’ll then proceed to not sell any of their own. Overall the 521 was a great phone for what I needed at the time. Super cheap, very light, and it just worked. Sure, it would have been nice to have flash, a ffc, more onboard memory, but for that price unlocked, it was hard to beat. I just with T-Mobile would at lease acknowledge their horrible record or providing or stocking accessories and just go with a standard phone so we can go elsewhere for them. I may buy one of these as a backup phone if it has an aggressive price like the 521. I am praying that T-Mobile releases the 930 though. I want the 930 as my main phone!